CleanPlex® Ready-to-Use and Custom NGS Panels are designed using our proprietary ParagonDesigner™ algorithm and optimized through an iterative process by our expert scientists to ensure maximum target design rate, as well as robust coverage uniformity, high on-target rate, and low amplification bias. CleanPlex NGS Panels can be designed to multiplex from 7 to more than 20,000 amplicons per primer pool to interrogate hundreds of genes simultaneously. New gene targets can be easily added without sacrificing performance, allowing your assays to evolve to stay current to the latest discoveries. Our superior primer design ensures that targets, including those in difficult regions, are successfully amplified to generate maximum coverage, minimizing assay failure due to dropouts of the desired targets. Effective background removal for all multiplexing levels. Libraries were prepared with CleanPlex NGS Panels of varying sizes (7 to 8,000 amplicons) and examined on an Agilent® Bioanalyzer®. All libraries generated a clean peak indicating minimal formation of non-specific PCR products. The data shows that CleanPlex background cleaning chemistry is effective regardless of the level of multiplexing, which means new targets can be added without affecting performance. High performance regardless of panel size. Libraries were prepared with CleanPlex NGS Panels of varying sizes (15 to 1,500 amplicons) and sequenced on an Illumina® platform. 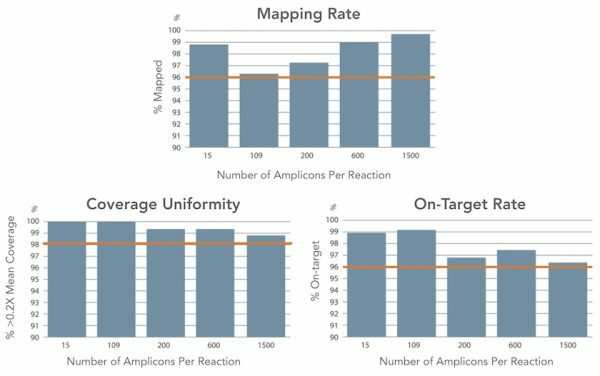 Mapping rate was maintained above 96% and increased with the number of amplicons used per reaction, indicating that CleanPlex chemistry is even more effective on libraries prepared using larger numbers of amplicons. Coverage uniformity, measured as % covered by at least 0.2X mean coverage, was maintained above 96%. On-target rate was also higher than 96% for all panel sizes. Minimal GC bias across panels of different size. Libraries were prepared with CleanPlex BRCA1 & 2 Panel (109 amplicons) and CleanPlex OncoZoom Cancer Hotspot Panel (601 amplicons) and sequenced on an Illumina platform to a mean depth of 1,822 and 1,433, respectively. For both panels, amplicon read counts were evenly distributed across GC content, indicating minimal preferential amplification or dropout due to differences in GC content.